Anyhow, the other day I was able to take the Soma SS on its first longish ride. The Fullerton Loop is about 11.5 miles and it has a mixture of ups and downs, as well as wall rides, teeter totters, boulders that chase you, darts that shoot out at you while you’re riding away, and some guy name Jones…Indiana was his first name. Ok, you got me, that stuff about wall rides, boulders and such were made up. But wouldn’t it be cool! But I digress, my gearing on the Soma is 32t/20t. I had feared that having such a big cog in the back would make me spin too much on the flats, well it’s true, I was spinning like a hamster on a wheel. However, it was the perfect gearing to ensure that I could clear all the climbs. I did dry heave a few times because I found myself exerting my body in order to keep up with Priscilla and our friend Ben. Then again I recall when I was SSing with a 26er, it was pretty common to get that nauseated when I was working hard. So far the Soma is doing great! No chain skipping or breaking, and riding on drops was a great experience. My only complaint would be the brake levers I installed. One of my friends donated them to me, I thank him for it. But they are just a tad to small and the reach was too far. You see, my hands are like biscuits with baby carrots as fingers, yes wide and stubby (Moe, don’t even…). This mean that braking was a bit of a task and proved to be difficult especially if you’re going down the trail fast. I ended up ordering some Tektro XLC brakes from Jenson USA. Funny thing about these brakes, I searched for “Road Bike Brake Levers” and they didn’t show up on the Jenson site. So I Googled it and found a link back to Jenson in turn I purchased them for about $17. 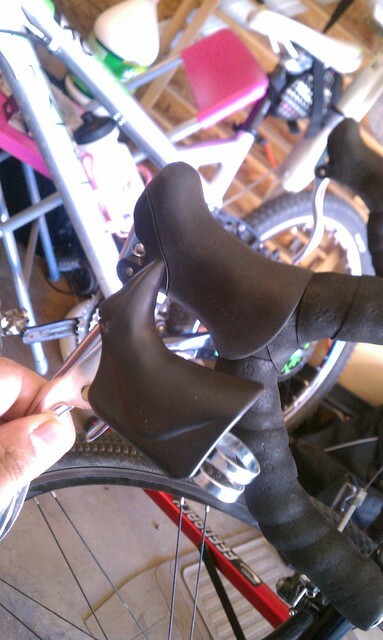 These brake levers are awesome! Not only do my hands fit in them, but they are ergonomic and has 2 reach settings. Not bad for $17! 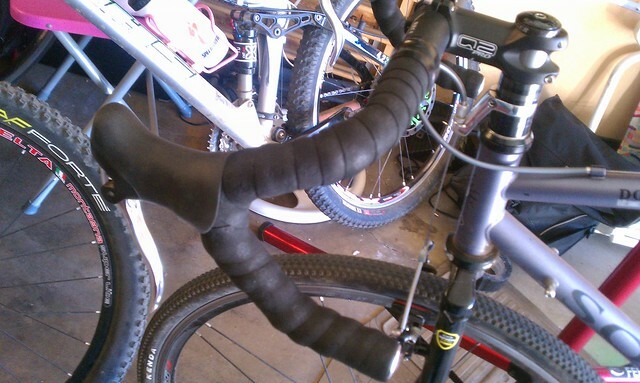 Here’s a photo of the old lever in comparison to the new. I’m hoping to get another ride in before the weekend is over. I gotta see if these levers are as awesome as I am hoping them to be. So until next time, I’ll provide you all with another Supdate….get it? Supdate…aye never mind. haha…supdate. It’s so not funny but I’m still laughing. The bike looks so good in that form. Wanna climb Mathis with me on that?